I don't get to read for fun as often as I would like but, I was able to squeeze this novel in and I strongly urge everyone to read it. As the current American population grapples with the threat of a recession; tens of thousands of people in Africa are dying daily due to HIV/AIDS and millions of children are orphaned. Taking action to aid then becomes a choice between individual comfort and the desire to better the world for all living beings. 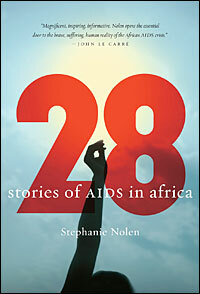 I loved this book simply because Stephanie Nolen aimed its readership not towards those individuals that have made HIV/AIDS there sole life purpose but to those individuals that may have become complacent about the horrors and deleterious effects of HIV/AIDS. However, experts fighting in the midst of the HIV/AIDS crisis may find renewed strength and vigor in the very open and honest and oftentimes painful stories narrated by Nolen. It is important to remember that “AIDS has robbed them of much more than health” it has robbed this people of a productive life; and left them with a legacy many would rather keep hidden (Nolen, 2007, p. 17). Martin Luther King Jr. said it best “in the end, we will remember not the words of our enemies, but the silence of our friends”, after reading Nolen’s 28 stories no one in good conscious can or should remain silent. Jazzy, have you seen The Clinton Plan for Africa? Now that you have thoroughly depressed me, no really thanks for the information I will be passing the link on to my friends. I had heard of Clinton’s plan for Africa and I have never believed that assistance to Africa is provided altruistically. However, after reading the details I am truly saddened that deception and greed are so paramount that people continue to use and abuse those that are increasing marginalized by society. I now understand the intense and furious battle the Clinton’s are waging to get re-elected to office. My question now is how will it be possible for Obama do anything other than follow the status quo, this plan has long been devised over a period of time and does benefit America. Also how is that we as Americans don’t know or even realize the depth of deception our government perpetrates upon other nations, do they keep us blind by the constant need to work to obtain more that we are kept oblivious to their machinations.